Piloting the 2014 Proton Satria Neo, it’s apparent the business arrangement isn’t completely one sided – Proton has definitely picked up some tips from the company it devoured. The steering is direct and to the point, rivalling that of many exotic sports car manufacturers. There isn’t a ton of power on tap, but the hatchback’s precise road manners compensate, keeping the fun factor in the black. This has been accomplished with a tunable multi-link rear suspension, revised cross member, and more aggressive spring and damper rates. The only engine offered is the 1.6-litre CAMPRO unit producing 111bhp/148Nm of torque, and a top speed of 118mph. You can get this mill bolted to either a manual gearbox or four-speed automatic transmission. But really, who would want a slushbox in this hot hatch? 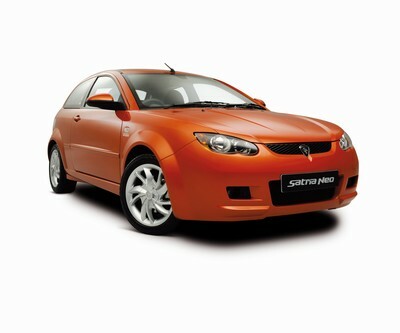 The 2014 Proton Satria Neo looks every bit the part of a tuner straight off the set of the Fast and Furious, especially if you get it in the energy orange metallic colour displayed in most of the press releases. That’s the hue to pick if you want to draw attention to the fact you’re driving a sub-£10,000 supermini. Unlike the majority of burgeoning vehicles entering the market, the Satria Neo hasn’t grown much from the previous model. The little car is only 3,905mm long, although the wheelbase and the track have been extended, freeing up more room inside. The Proton packs a great deal of cargo space into a pint-sized wrapper. With the 60/40 split/fold rear bench seat in place, there’s 286 litres of space. Fold that seat down, and you acquire a whopping 615 litres for your miscellany. A sliding front seat with memory function is available in the three-door body style, making access to the backseat less laborious. The driver gets a height-adjustable steering wheel that accommodates a variety of body types, including the very odd. For being a cheapo-mobile, the Satria Neo is fairly well equipped. The GSX gets an MP3 compatible Blaupunkt CD stereo (CDs? What are those? ), air-conditioning, twin airbags, and ABS brakes with electronic brakeforce distribution as well as a fuel monitor. There are also 16-inch wheels, a rear spoiler and body coloured electrically adjustable and heated mirrors. Opt for the Sport model, and even more accoutrements are added to the menu. One of the perks of owning a diminutive little box is low cost of ownership, and the Satria Neo doesn’t disappoint – well, not completely. Economy figures are ho-hum with 28mpg around town, 61.4mpg on a longer trip and an average of 42.8mpg. Emissions are pegged at 157g/km. Residual values for the Proton are paltry as well, so you had better be prepared to commit to your Satria Neo for the long haul. The financial highlight of the three-door is the purchase price which ranges from around £7,000 to £10,000. So, does the 2014 Proton Satria Neo earn the Lotus badge appended to its hatch? That might be a stretch, but it does look good and drive well in its own right, especially if you pick up the 1.6-litre version. Proton hopes to market their three-door to those looking to tear up twisted tarmac on a budget, and the 2014 Proton Satria Neo fills this niche. It may not be the entire vehicular package but for the price it will get the job done and you’ll have money left over for the really exciting purchases like that new washing machine and tumble dryer you’ve been pining for. If you want to lease or finance the new 2014 Proton Satria Neo then don’t hesitate to leave us a message on our contact us page or give us a call on 01903 538835 to find out about our 2014 Proton Satria Neo offers and Proton lease deals.